A quality deck gives you the opportunity to further enjoy your outdoor spaces. We use only the highest quality materials, chosen for their attractive appearance and durability. Whether you are looking for a place to relax, a place to entertain, or a bit of both, we can work with you to create a custom design centered on your needs and based on your property’s unique landscape. Before the project plan is create, we will meet you on your property to review the space. We will listen to your desires and preferences, making sure the deck is completed in a style that suits your taste, with the function you need. We will review your materials choices, helping you find the balance between longevity and affordability. We will arrive at the scheduled time on the day of your appointment. We will review the project details, making sure you are fully apprised of the installation schedule and the steps along the way. 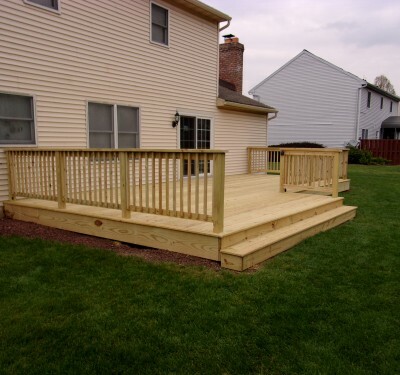 Once we begin, we will work diligently to complete your new deck in a timely and orderly fashion. Once it is complete, we will perform a final walk-through with you to ensure that all of your expectations were met, if not exceeded. All construction debris will be removed, ensuring that you can begin enjoying your new deck as soon as it is complete.